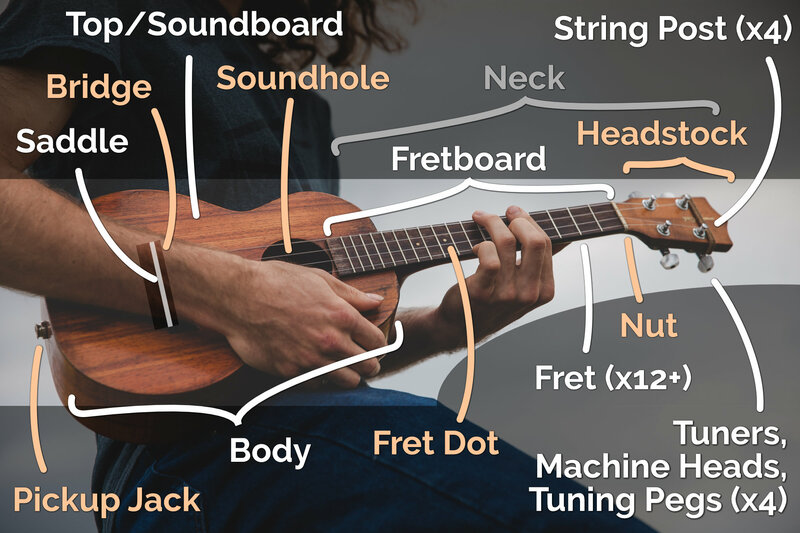 “Thingamajig” has worked in a lot of situations, but it’s much easier to know the correct terms for the parts of an ‘ukulele. Once you start getting into setups or shopping for different instruments, it’s important to know proper terminology so you can express yourself. 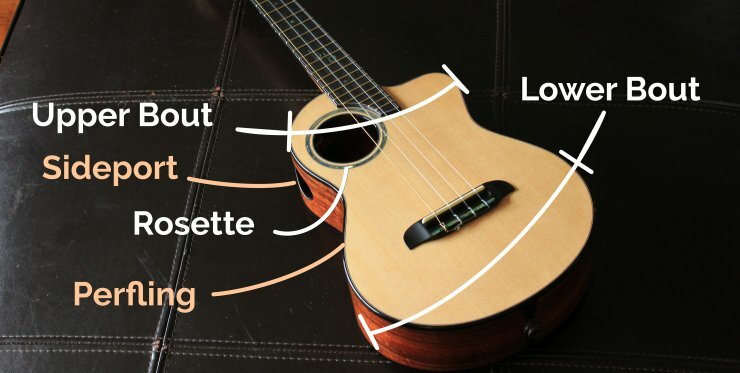 Here you’ll find the parts of a uke labeled and identified. Click any of the infographics for larger sizes. The body is the wooden soundbox made up of the back, top, and sides. This is the main sound-creating part of the ‘ukulele. These pieces of wood work together to project the sound out of the instrument. There are two main ‘ukulele body styles. The standard body style has both bouts, like the above image. A cutaway body style has the bottom half of the upper bout scooped away so that it’s easier to reach the higher frets (like the below picture). The soundboard is the top of the body of an ‘ukulele. It’s what the audience sees as you play. It holds the bridge and has a soundhole cut in it to allow the sound vibrations out. Usually the soundhole has a rosette inlayed around it for looks and strength. Fancier instruments are often bound with perfling to give some color contrast to the instrument and create a stronger edge around the top and, sometimes, back. Perfling is often made with a dense wood that handles impacts better than the tonewood used for the soundbox. (Not shown) Thin strips of wood that are glued inside the uke along the top and back. They help strengthen the ‘ukulele and keep the top from warping under the pressure of the strings. The piece of wood that forms the back of the body. It sits opposite the soundboard and rests against your body as you play. Often the back is “bookmatched” – cut symmetrical so that a piece of wood lays open like butterfly wings to display matching grain patterns. It can also be curved outwards for comfort and tone. Sometimes the back is a different kind of wood than the top. Builders often use a harder wood for the back and sides and a softer wood for the top. For instance, spruce top with rosewood back/sides. The label is a piece of paper located inside the soundhole that shows info about maker, model, date, serial number, etc. The pieces of wood that make up the sides of the ‘ukulele’s body. They hold the shape of the instrument and give it depth. The sides are usually the same wood as the back. These perforated lengths of wood known as “kerfs” are bent along the inside of the sides to create a larger attachment surface area for the top and back. It also helps make the instrument more sturdy. A new-age sound hole that is put on the upper bout of the ‘ukulele near the player’s face to allow for better monitoring and create a less “trapped” sound. The pickup jack is located on the bottom of a uke on the side. This is where you plug in an instrument cable to amplify the ‘ukulele. It often doubles as a strap button. The bridge is how the strings of the ‘ukulele are connected to the top. It transfers string vibrations to the body. It’s glued on and put under lots of tension making it the most common failure-point of an instrument. There are several types of bridges. They mainly vary in how the strings get attached. Standard bridge – the string goes through a hole in the bridge and then is tied into a special knot. Slot bridge – a stop-knot is tied in the string and then slid into a slot in the bridge. String-through bridge – just like the name, the strings go into a hole in the bridge, through the top, and come out inside the ‘ukulele. Then you tie a stop knot to hold the string from pulling back through the hole. The saddle sits on top of the bridge and holds the strings above the fretboard. It’s removable for action adjustments. The neck of the ‘ukulele is the piece of wood that suspends the headstock, tuners, fretboard, and frets in a manner that allows the players’ hand to go around it and fret notes on the strings. The heel is the deepest part of the neck where it joins the body. The heel usually curves out from the normal path of the neck to end flush with the back of the instrument. The heel is usually where a strap button is attached. It’s used to fasten a strap to the ‘ukulele. One goes on the heel of the neck and one goes on the opposite side of the body where it can be mounted on the tailblock. The fretboard is the piece of wood glued onto the top of the neck that holds the frets in place. It’s usually made from ebony or rosewood to contrast the body. Frets are little strips of metal that are placed in slots on the fretboard. When you finger a note the fret makes the vibrating length of the string shorter so that the pitch is raised up a certain amount. An ‘ukulele can have anywhere from 12 to around 19 frets. These little dots or inlays are made out of plastic, abalone, or other materials and give you an idea of where you are at when you are playing. Usually markers go on the 5th, 7th, 10th, and 12th frets. Sometimes they are placed on the side of the neck so you don’t have to look over at the fretboard. The end of the neck that holds the machine heads in place. You usually find the brand logo on the headstock. Standard – where the tuning pegs poke upwards through a flat headstock (like the Kamaka in the first picture). Slotted – where the strings come to rest in a slot and the tuning pegs point sideways into the headstock (like the Moore Bettah above). Four of these adjust the pitch of each string. A knob turns to control the note the string is tuned to. 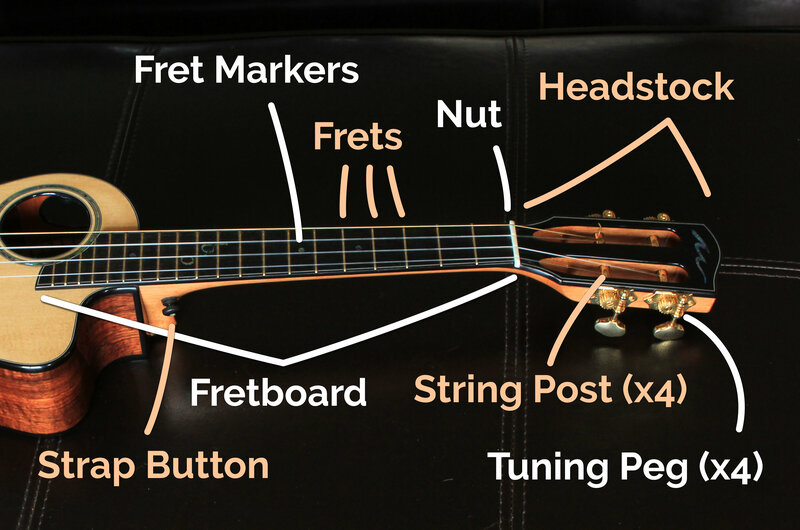 The nut holds the strings of the ‘ukulele at a proper hight over the fretboard and creates the break angle necessary to hold the strings down once they leave the tuning peg. It also ensures they are spaced correctly.